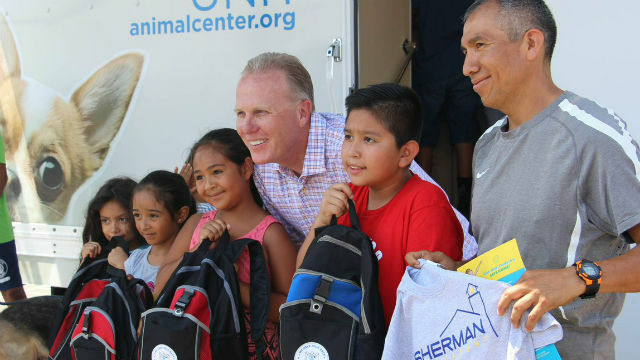 San Diego-area Realtors and Mayor Kevin Faulconer distributed backpacks and other supplies Friday to students at the first of five elementary schools targeted for back-to-school assistance. The “We Have Your Back” program sponsored by the Greater San Diego Association of Realtors‘ Ambassadors Foundation and Faulconer’s nonprofit One San Diego made its first visit at Sherman Elementary in Sherman Heights. Other schools that will be visited are Porters Elementary School near Valencia Park, Kimbrough Elementary School in Grant Hill, Logan Elementary School in Logan Heights and Perkins Elementary School in Barrio Logan. In addition to school supplies, the Ambassadors Foundation provided families with bilingual guides with home safety tips and instructions approved by the police and fire departments. Faulconer was joined by his wife, Katherine Stuart Faulconer, San Diego Unified Superintendent Cindy Marten and police and fire department officers at the event. For over two years, One San Diego has provided students in underserved areas with backpacks and school supplies. This year, One San Diego expanded the program by partnering with the Ambassadors Foundation to reach more than 3,000 students.